Stocks has been electric today with both the bank and the boats seeing some serious fish being caught! It has been a mild spring day with intermittent sunshine and a slight breeze creating a ripple on the surface ideal for us fishermen. Here’s how it all went. I’m giving everyone who caught fish a quick mention seeing as no one blanked today. Ron Daniels came fishing today only for a few hours mid day and caught 3 fish but lost many more. He was fishing on a floating line with dry flies, hoppers to be precise. Great stuff Ron glad to take a report from someone fishing dries this season! Frank Thomson saw 4 fish today between the two trees and barn quarry. He caught on a floating line using a dawsons olive. His best fish was a 3lb rainbow. Mick Counsell caught 5 fish in total today in Hollins and from Bens Beach. Mick caught on a green/black montana on a floating line. Stuart Gardiner caught 7 fish from Hollins Bay and Barn Quarry today. Stuart was also using a montana but saw fish on a cats whisker too. Alex Hitchen netted 8 fish safely today from Barn Quarry, his best a 3lb rainbow. Alex was using a montana but I don’t know what line he fished with. John Duff also had 8 fish from the bank today. Johns 3 fish bag weighed 9lb. He caught his fish using a double viva booby on his point with a watsons bumble on the dropper fished on a floating line and with a long leader. His hot spots were Hollins, Bens Beach and Bell Point. George Taylor had a good days sport in Hollins Bay catching 12 fish in total, his 5 fish bag weighing 11lbs 4oz. George caught on twinkle nymphs fished on a floater with a slow retrieve. He mentioned they were taking it on the static also. Nice work George! David Speak was by far the top rod today from the bank seeing a whopping 26 fish in total, with his 3 fish bag weighing 6lb. He caught all day on a cats whisker and was fishing to the right of the jetty in Hollins Bay. Great result! Alan Daniels, one of our regular weekly bank anglers took to the boat today as a treat for his birthday ( I like this idea) Alan caught 4 fish in the northern shallows and was using a green/white cats whisker fished on a floating line. Glad you had a good time on the boat Alan! Simon Challenger saw 4 fish also from the boat today and he too was fishing using a cats whisker. I think he was fishing off Bell Point. John Ashworth caught 5 fish off the boat today using olive damsels. Andrew Brown also had 5 fish to the boat today , his best a 3lb 8oz rainbow. He was also fishing off Bell Point and using a cats whisker. John Sykes had a great days fishing in the Northern Shallows seeing 17 fish in total. When it was overcast he was hitting them on a cats booby and diawlbachs and when the sun was out he caught on a damsel nymph all of which were fished using a slow intermediate line. Great stuff and a thorough report slip thank you. Andy Hulls also had 17 fish today, his personal best today. He caught with buzzers on the dropper and a booby on the point fishing a washing line method in the northern shallows. Nice work Andy! Ray Bird (nee Rare Bird) pipped his boat partner Andy to the finish today with a cracking 23 fish to his end of the boat. He also caught with buzzers on the dropper and a cut down booby on the point. Ray used a midge tip line. Good angling and a personal best at Stocks for you too I believe! Hats off to Derek Moore today however…… Derek has fished Stocks this season and caught massive amounts of fish thus far, a great pioneer and ambassador to the term ‘rod average’ and today he also achieved his own personal best at Stocks with a staggering 32 fish to the boat and with lots and lots of hook ups… Derek saw at least 18 fish on a dawsons olive booby and caught the remaining 14 or so using a mixture of red/black buzzers and cormorants. He had fish take his point fly, his top dropper and also his middle one evenly throughout the day. He saw his first 7 fish quickly in Newclose before moving out towards willow island and the northern shallows. To quote Dereks final words before leaving he said… ‘for a days fishing you just can’t beat it. Awesome’! Say no more, I think today’s results speak for themselves, long may it continue…. This entry was posted in Stocks Reservoir Fishing Reports on April 30, 2013 by Ben Dobson. A quiet day up here today although weather conditions have been stable and pleasant throughout. No boats today just a handful of bank anglers so I shall keep todays report short and sweet…. Robbie Dobson saw 3 fish today from the quarry area. No information supplied regarding flies or method I’m afraid. Dave Fitton also had 3 fish from Bens Beach. He was using a pea, not sure which type or what line he was fishing on either. His 3 fish bag weighed 7lbs 8oz. Keith White fished lures in and around Hollins Bay and had 4 fish weighing 8lbs. Ian Cooper also had 4 fish today on a half day ticket, his best being a 2lb 7oz rainbow. Ian was fishing using an orange booby in and around Hollins. David Keable had 5 fish today in and around Hollins also. He had a few on a hot headed damsel, the rest taking the green pea and a yellow booby/blob fritz type fly. He alternated from a slow to a fast fig. 8 retrieve. This entry was posted in Stocks Reservoir Fishing Reports on April 29, 2013 by Ben Dobson. It was a cold wet start to the day with limited visibility and limited wind for a short while until approximately 11am when the wind picked up. There was a chill in the air today and it wasn’t a particularly nice day to be outside. But opinions set aside for now, Stocks fished fantastically again and although there weren’t many on at all (one bank angler brave enough to battle the elements and 10 anglers from the boat) there were some decent fish numbers achieved. . .
Top rod overall today and all done and dusted by 3pm Peter Kosminski had a belting days fishing from Bell Point. He was using a slow/intermediate line with a green/black/gold montana nymph pattern and was stripping fast as soon as his flies touched the water. 22 fish in total and with the firm belief it could have been 30 had he stayed out a while longer! Good work Peter, a heavy score in such torrid conditions out on the point. All anglers from the boat saw fish today. Here are the stand out results…. Scotsmen, Sandy Whiteside and Sandy Whiteside Jnr were out again today and were in fine spirits. They saw 13 fish to their boat using red headed damsels with a quick retrieve on an Intermediate line. They were in the Northern Shallows all day and saw plenty of sport from there. Thanks again lads I’m pleased you enjoyed your two days so much and it is worth mentioning a touching comment made by Sandy senior. To quote…. A compliment that has echoed all around the lodge since the season began and one we are very happy to hear from all of our visiting anglers. Moving on, Pete Langham had a good days sport seeing 12 fish to his boat with his 5 fish bag weighing 14lbs. Pete caught in Hollins on black/red blobs and cormorants. He was fishing a floating line with a steady fig. 8 retrieve but was letting his flies sink for a while prior to beginning his retrieve. Nice work Pete. Top rod from the boat and very nearly overall fell to Steve Bland. He had a cracking day out on the boat seeing 20 fish safely to his net. Steve saw all three trout types today of similar sizes. He was fishing a DI3 with a small florescent yellow/white cats booby on the point with a hot headed damsel on the dropper. Steve caught at Currys, Gull Island, the Causeway and Willow Island and was able to overcome the difficult wind and fish a v. slow retrieve to ensure he caught in large quantities. Nice angling, a great result. This entry was posted in Stocks Reservoir Fishing Reports on April 28, 2013 by Ben Dobson. SPORT: It was typical spring day today; we had every conceivable fishing condition packed into the space of 12 hours! However the trout didn’t seem to care and the reservoir continued to fish really well with the rod average of over six fish for both bank and boat. There were loads of good catches today but on similar methods so I’ll name just a few. On the boats Colin Gibbons took 13 fish on a floating line, with crunchers on the droppers and a cat on the point. Stuart Halford also had 14 fish on an intermediate line, inching back a cats whisker and Gavin Murray took 12 doing the same thing. Colin and Stuart both caught very well at The Willows, which is where Gareth Jones caught his cracking bag of fish that included blues of 4lb and 8lbs 12oz. Gavin took most of his at the Northern Shallows. Tim Osborne and Martin Knowles had 22 to their boat on Black fritz patterns fished on floaters, and farther and son team Sandy snr and sandy jnr Whiteside had 16 trout on a similar set up but with hot head damsels on the point. Their catch included a monster rainbow, which was estimated at 14lbs and returned to fight another day. Chris Skerrat and Derek Hornsby also had a double figure rainbow along with 18 others, they used sinking lines and boobies twiddled back slowly. On the whole most of the trout caught today seemed to fall to lures retrieved very slowly, the best areas were The willows, Gull Island, Willow Island, the Northern Shallows and The Causeway. The shore also fished very well once again it was mainly lures in the morning but once the wind dropped away there were quite few fish taken on buzzers. Paul Dobson took 9 good browns and rainbows from around the jetty area on a green pea and black buzzers. Dave Flitcroft also had 9 fish, this time from Bell Point on an intermediate line and cat’s whisker. The best catch however went to Jim Connell with 12 trout, he caught rainbows, browns and blues to 3lbs on green peas from around the jetty area. James Dalby has beatewn his record again with this lovely 2lb 7oz rainbow. It’s creeping up. It was Jory Hunt’s first day working at Stocks today. Jory has been fly fishing for two years and is currently studying sport at Myerscough College. We welcome him onto the Stocksd team. This entry was posted in Stocks Reservoir Fishing Reports on April 27, 2013 by Ben Dobson. SPORT: Despite being bright and windy the reservoir fished very well. Today 20 anglers from the northwest CSSC took to the boats to try and qualify for their national final. They spread out over the reservoir, some stayed in Hollis Bay, some treid to get shelter at the Dam, and some went to Ben’s Beach and Newclose and some to Willow Island. Between them they caught 115 trout, about half of which were returned to fight another day. 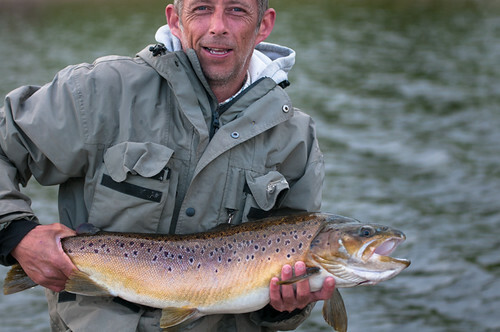 George Ashton was top of the bill with 20 trout to his name. George used a streamer tip fly line with a black nomad on the point and cormorants on the droppers and concentrated his efforts around Willow Island. In second place with 14 trout was Alan Turner. Alan caught along Ben’s Beach and at the Northern Shallows with a fast sinking ling and boobies twiddled back slowly. In third place with 12 fish was Henry McCormick, Henry also found the booby technique to be the most productive. It was great to see you all again guys, it’s always a pleasure and well fished. Outside of the competition and with 17 trout was Keith Charnock. Keith fished at Willow Island until it got to windy then in Newclose bay. He fished a floater all day with a small cat on the point and two diawls on the droppers. He said he lost at least as many and that the trick seemed to be a bit chartreuse in the patterns. This entry was posted in Stocks Reservoir Fishing Reports on April 26, 2013 by Ben Dobson.